Tremlett's Bitter - Cider apple tree £12.75 - Cider Apples - Bittersweet Apple Trees and Fruit Trees For Sale. Buy at competitive prices with wholesale discounts. Tremlett’s Bitter produces a full-bodied bittersweet cider. 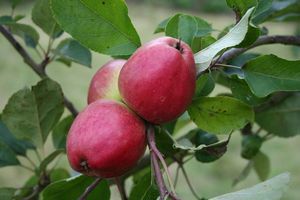 A popular Devon variety, it has been a mainstay in commercial orchards for many years. Although it has a biennial tendency, crops can be prolific and trees make a pretty picture when groaning with the strikingly bright red shiny apples. The juice is sweet, astringent and full of hard, bitter tannin. It is one of the earlier flowering cider varieties, and blossom is noted for its frost tolerance.